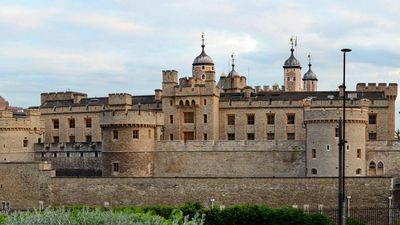 The Tower of London is a military fortress in central London. It is nowadays one of the major elements of the British capital's heritage, but it is above all a place that has strongly marked the history of the United Kingdom. This citadel was the place of power of the kings of England for centuries and it served as a stronghold to control traffic on the Thames as well as the city itself. It is a fortress, that is to say a fortified castle with a certain number of facilities which allowed to live in autarky. In fact, we are almost in the presence of a small town, the ramparts forming the necessary protection. The Tower of London, seen from the South. As for the ditches, their width is constant at 30m except on the eastern part of the fortress where the ditch has been greatly reduced to make way for the road leading to the Tower Bridge, an important artery of London. On the south side the moat is much smaller, it is only 10m wide. 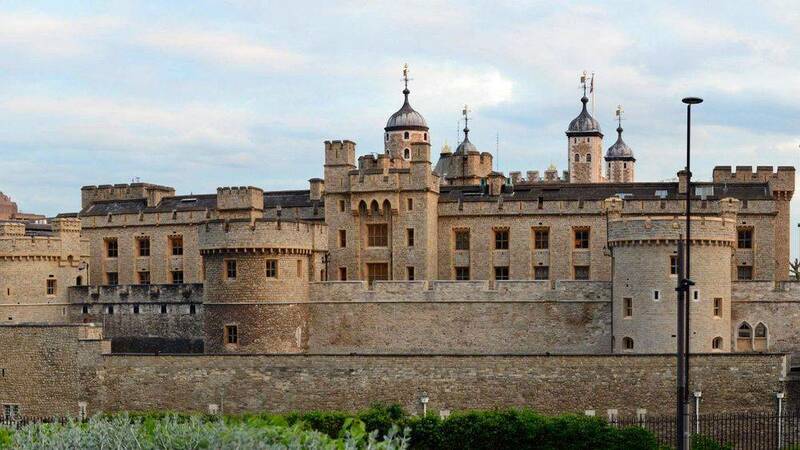 The entrance to the Tower of London is via the Byward Towers, but other towers precede it, the Middle Tower. They are about 40m away from the Byward towers, a distance to better control the entrance to the tower. They are equipped with a drawbridge. 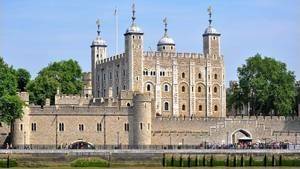 The White Tower is the tower of the Tower of London. Main building, it is also the most interesting because it contains museum exhibits very well exposed. The white tower has a rectangular palm of 36m long by 32.5 wide, its height is 27.5m. Its walls are 4.6m wide, which is quite impressive, it must be said. 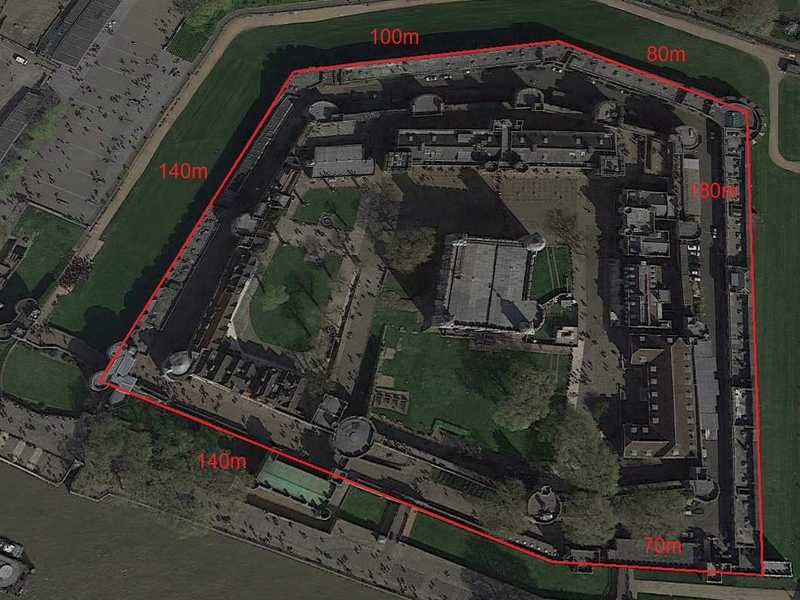 The Waterloo barracks, on the other hand, measure 90m long by 20 wide. It has two towers at the front and one at the back, which makes the building even more massive than it is. The general district of fusilliers is a smaller building, it is "only" 30m by 20m, but it is equally impressive because it dominates the others, it is rather high, and above all elevated. It has a large staircase. The other buildings are on the same scale, approximately: 30m x 20m for the hospital, 40m x 20m for the workshop, 20m by 15m for the royal chapel. And finally, it is necessary to know that the old wall, that which delimits the center of the citadel, measures approximately 30m of length. 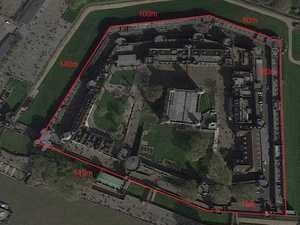 The southern rampart, which runs along the Thames, is 240m long. It forms a small angle at 140m from the western rampart. The eastern rampart is in a straight line, it is 180m long to the center of Mount Brass. From this building to Mount Legge, the rampart forms an angle, the two parts are 80m for the first (to the east) and 100m for the second (to the west). Finally the West rampart is 140m, from Mount Legge to the Byward towers of the entrance. The main rampart is distant from the second by about 8m, but it varies according to the area, for example it is a little less on the east side. The outer ramparts are 10m wide all round, except on the south side where it is a simple wall. When the two artillery towers North, Mount Legge in the West and Mount Brass in the East, they are both 20m wide. They have similarities with the corner towers of the fortress of Salses, in the South of France.